Studying Kung Fu in Melbourne at Six Harmonies Martial Arts will give you the opportunity to strengthen your mind, your body, improve your flexibility and help you look and feel 100%. Learning to protect yourself and the people you care about is another great benefit of learning Kung Fu at our school. As well as learning the traditional forms we place a great deal of importance on all students learning the practical applications of techniques because you just never know when you might need to use your training to protect yourself, your family or others. Be assured that by making the decision to start your training at our school, we will teach you the kills you need and show you to how to build your self confidence, improve your self discipline and to overcome life's many challenges.... guaranteed. Kung Fu training in Melbourne has a long history stretching all the way back to the days of the gold rush in the mid 1800's when many Chinese prospectors first arrived in Australia bringing their culture with them. One system that has become know for high quality students is the Shaolin Liu He Men - Shaolin Six Harmonies Kung Fu that we are fortunate enough to study at our school. 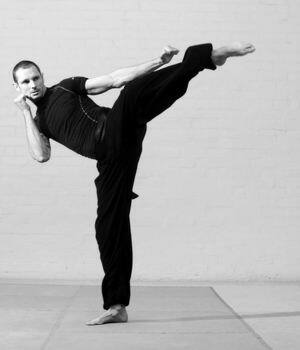 Liu He Men is a traditional Chinese Kung Fu system based on the theory of six combinations. Three internal combinations being: spirit, breath and mind and the three external combinations being: eyes, hands and the body. When you can successfully harmonise these six combinations you will experience an ideal state of health, energy and self defence. Occasionally we host Kung Fu Masters visiting our school in Melbourne, like Master Qin in the clip above, directly from the Shaolin Temple in China, inspiring all of us to keep our training fresh, exciting and at a high standard. We are pleased to offer a free 3 lesson trial for any new students that are interested in training in Kung Fu at our Melbourne school (located in St Kilda). Booking a time is very simple, all you have to do is call reception and arrange a time that suits or fill in the form below and we will contact you to arrange a time. If the phone is unattended please leave a message and we will call you back as soon as we are able.